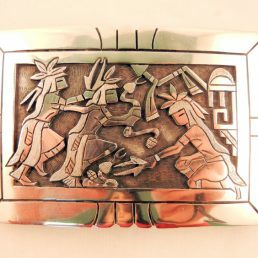 Like the Navajo Nation, the Hopi Indians were the benefactors of the Spaniards’ silversmith tradition. While the two nations’ influences are evident in the art of the other, Hopi jewelry artists sought to distinguish themselves from other Southwestern Indian jewelry artists. Beginning just before WWII, Hopi Indian jewelry artists have developed a characteristic style, one that uses little stones but intricate overlay design work. 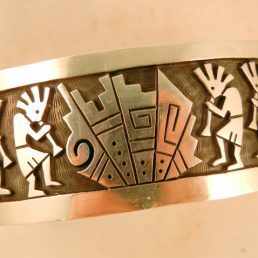 Chalmers Day is the most well-known Hopi jewelry artist. Day has been creating jewelry since 1972. 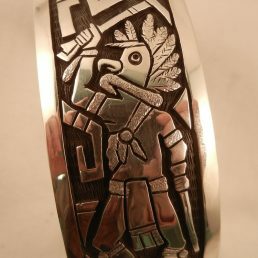 During his career, he has been awarded First Place at the Santa Fe Indian Market, a high honor within the trade. 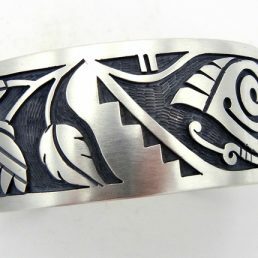 The sterling silver overlay characteristic of Hopi jewelry requires two pieces of silver. 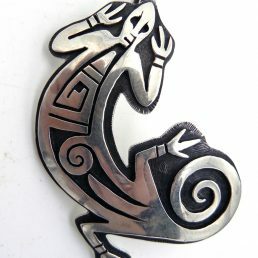 Designs are cut into one piece, which is overlaid and soldered to another solid piece. 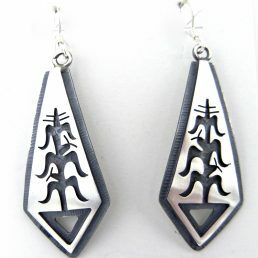 This gives Hopi Indian jewelry depth, which is sometimes accentuated by the use of an oxidized or textured silver base. The brushed or polished overlay stands in brighter contrast to the darker background. The intricacy of the overlay patterns in the small space that earrings and pendants, in particular, allow is truly amazing and speaks to the talent of the Hopi Indian jewelry artists. 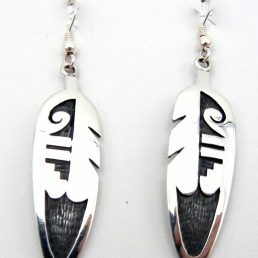 Palms Trading Company buys jewelry directly from Native American Indian artists. 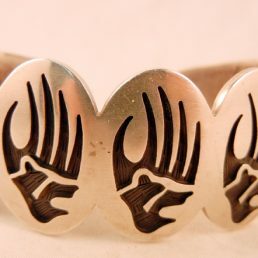 We guarantee that our Hopi Indian jewelry is authentic. 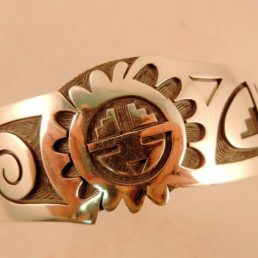 And our relationship with the artists allows us to sell Hopi Indian jewelry 50% below retail. 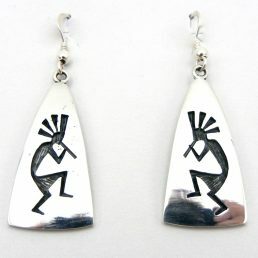 More Hopi Indian jewelry is available in our store. If you can’t get to Palms Trading Company to peruse our collection yourself, our personal shopper can assist you. Please contact us with any questions and refer to our sterling silver jewelry care tips to keep your Hopi Indian jewelry looking like new.